The MINAMAS group aims at developing research activities and producing new knowledge on materials, surfaces and nano-structured thin films for actuators, sensors and microsystems. 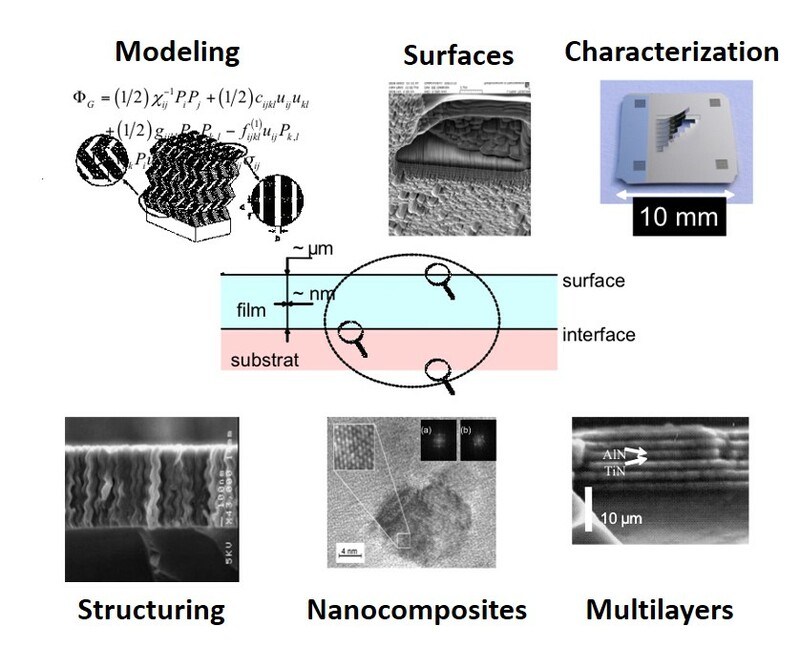 The strategy is to simultaneously implement investigations focused on modeling, fabrication, growth and characterization of solid materials (thin films, powders, surfaces ...) in order to better understand some potential interactions between different interfaces and surfaces involved in various microsystems. Such investigations can be illustrated with the following figure. Skills and experiences of the MINAMAS group include physics, mechanics, thin films growth and surfaces. These merged competencies lead to a synergetic effect, which is relevant for creating new knowledge and understanding physical behaviors of materials and surfaces in microsystems. Our Research Interests are focused on 4 topics: Thin Films, Mechanosynthesis, TEMM Coupling and Gas Sensors.